Today I am going to share with you 3 great low calorie recipes that are under 200 calories per serving. 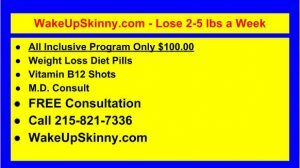 If you have never been to our weight loss center call us and schedule your free weight loss consultation. Call us at 215-821-7336. The recipes are for Apple Raisin Muffins, Pumpkin Muffins and Banana Pecan Waffles. Our son Noah will soon be home from College for the holiday break and my wife is already buying the ingredients for these recipes because they are his favorites. Your family will not believe that these recipes are for diet food so let me know how you and your family enjoyed them. First set oven to 400 degrees. Spray 12 standard-size muffin-pan cups with cooking spray. In a large bowl mix together flour, brown sugar, baking powder, baking soda, cinnamon and salt. Form a well in the center. In a small bowl mix together buttermilk, applesauce, egg whites and canola oil. Add buttermilk mixture into well of flour mixture. Mix until moistened (do not overmix). Fold in apple and raisins. Add even amounts to each muffin cup. Bake for 25 minutes. Let cool on rack. Enjoy! Preheat oven to 375 degrees. Use cooking spray on 12 standard-size muffin-pan cups and muffin-pan top. In a large bowl, mix together the brown sugar, allspice, ginger, cinnamon, salt, baking powder and flour. With 2 knives, if used as scissors you can cut butter until it appears as fine crumbs. Now in a small bowl, beat together egg substitute, pumpkin, milk, and vanilla until mixed. Add batter to muffin cups equally. Sprinkle pecans on top and bake for 25 minutes. Place muffins on rack to let cool slightly then enjoy! Toppings (optional): Butter, sugar free maple syrup, sliced bananas, chopped pecans. Start by heating a nonstick standard waffle iron. Now in a large bowl mix together flour, sugar, baking powder, baking soda, cinnamon, and salt. In a medium-sized bowl mix together banana, egg whites, whole eggs, oil, buttermilk, vanilla, and pecans. Create well in center of flour mixture, placing banana mixture inside. Quickly stir until flour mixture is moistened. Spray waffle iron with cooking spray, then add ⅓ cup of batter. Cook as instructions tell you. Add toppings you desire and enjoy! Please come back to this blog section next week because every week we add more great recipes that are keys to losing weight and improving overall health and wellness. *Source These recipes were taken from Eat what you love and lose by Peggy Katalinich. It’s a great cookbook and has lots of great low calorie recipes. This entry was posted in Diet Doctors in Philadelphia, Medical Weight Loss, Medical Weight Loss in Philadelphia PA, Medical Weight Loss Philadelphia, Weight Loss, weight loss philadelphia and tagged Diet Doctors in PhiladelphiaMedicalWeight Loss, Medical Weight Loss Philadelphia, philadelphia diet doctors, weight loss philadelphia on November 12, 2016 by Dr. Michael Kenny.